Coming up to Hallowe'en, I always get excited by it, even though I'm passed my trick or treating prime. I think I'm actually passed the point I care. I like the idea of Hallowe'en but I just see it as winter coming, weather colding, evenings darking, etc. I'm really getting miserable in my old age. I was trying to come up with a Hallowe'en related title for this and I'm sad to admit, the first thing I thought of was Sneaky Bat Machine. Ah, I miss the bad music I liked when I was younger. All I do now is work. I had meant to take a photo today showing the fading over the last 3 months, I was supposed to have a session 3 months ago. I was so busy in work this week (I've worked 10 days straight) that I haven't had an opportunity. I took a photo this evening but it was dark out and it's under CFL opposed to sunlight. I can't tell how much it has faded over the last 3 months, it is fading. Because of the different light in the most recent photo it's hard to tell. I think there is more skin colour visible in the most recent but that could be the light. Here's my thinking! My body has had more time to remove the ink than I would normally give it. I'm hoping the next session will break down more ink as the smaller particles have been removed. 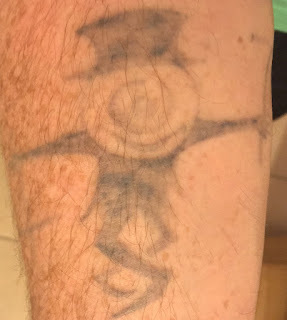 However I have realised that I basically have no idea what influences tattoo removal.